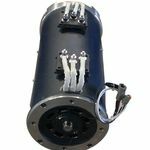 The AC-34/35 line of motors is the most popular line of motors for everything from performance motorcycles, general and performance automotive, to medium sized trucks. 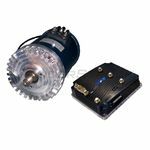 These drive systems are sold as a kit that includes an HPEVS motor, Curtis controller, contactor and Spyglass display. The Spyglass (model 840) displays rpm, controller/motor temperature, volts, and amps. Each Curtis controller is pre-programmed for your unique application. These systems do not require an additional inverter and use a DC battery voltage input.